A week or so ago I saw something on Twitter that made me shake my head. An apparently well meaning Hebrew enthusiast gleefully reported that, after searching through hundreds of manuscripts, he’d found thousands of places where the divine name (YHWH) was vocalized by scribes as “Yehovah” but (and here’s what tickled him) none vocalized as “Yahweh”. I’m not really sure why this would be so exciting, but I’ll hazard a guess — there’s probably some dislike for “Yahweh” as the pronunciation of the divine name and an urge to be “truly Hebraic” by proving he knows better — that the name is really Yehovah. This is silly. It shows a misunderstanding of why the scribes did what they did and why we can tell. I decided to make a short video explaining that. The discussion of Yehovah also made me think of Jehovah’s witnesses. I’ll be interviewed this weekend for the Deeper Waters podcast. We’ll be talking about how my work in Unseen Realm matters for talking to Mormons and Jehovah’s Witnesses. I thought I’d show you all something here that I will likely reference on that show. Jehovah’s witnesses are fond of saying that John 1:1 doesn’t said “the Word [Jesus] was God” but “the Word was a god.” They base that on the absence of the definite article before the Greek word theos (“God”; “god”). Now, there are lengthy scholarly refutations of their approach, but here’s something simple. You could show this to the next JW who knocks on your door. Question 1: are there any other instances in, say, just John 1, where theos lacks the definite article? Question 2: If there are, does it make any sense to translated those occurrences “a god” instead of “God”? 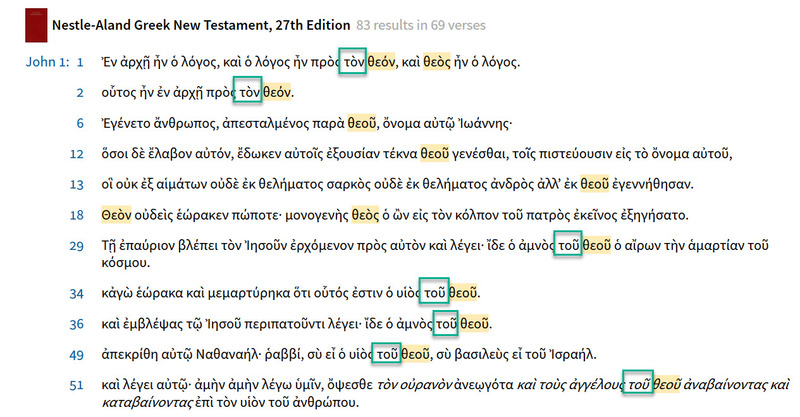 These are all the instance of theos (in any form) in John 1. Most of them have the definite article (green rectangle). That means the rest lack the article. Now how would those verses (aside from John 1:1, which the JW wants to read “a god”) sound if we read “a god” instead of “God”? Here you go — have fun with your JW visitor! There was a man sent from a god, whose name was John. (So the God of the Bible didn’t send John — but some old, other god did!). 12 But to all who did receive him, who believed in his name, he gave the right to become children of a god, 13 who were born, not of blood nor of the will of the flesh nor of the will of man, but of a god. Hmm.. . . I wonder which God was the father of people who believed in Jesus. Maybe they got to pick their favorite! No one has ever seen a god; the only god, who is at the Father’s side, he has made him known. So, no one ever saw a god … not even Moses (Exod 33-34)? Abraham (Jehovah comes to Abram as a man – Gen 18)? But the particular god at the Father’s side (if that isn’t Jesus, which god is at Jehovah’s side?) has made him known. How? 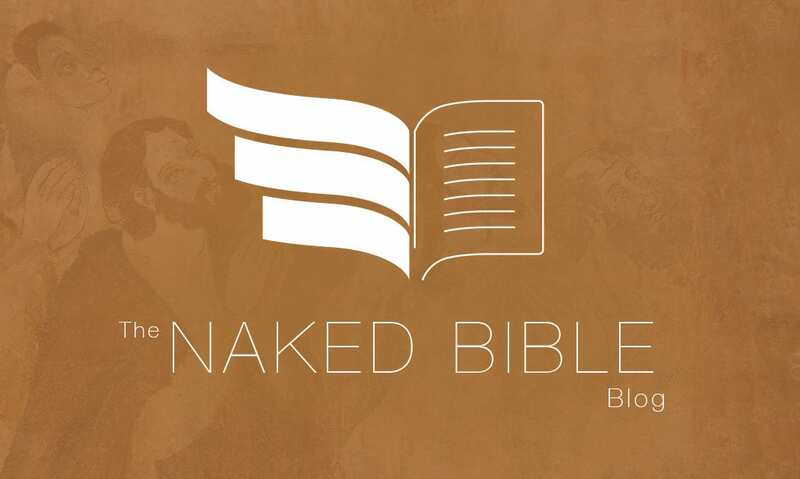 How did that other god make Jehovah known? Naturally, JWs have their own Greek NT. They may have thought of this before — but how many JWs bring a Greek NT with them? At any rate, I usually go right to Exod 23:20-23 and other passages where the angel of YHWH is identified with YHWH and then go to Gen 48:15-16. They don’t see that coming. But it’s in their preferred Bible, the OT.